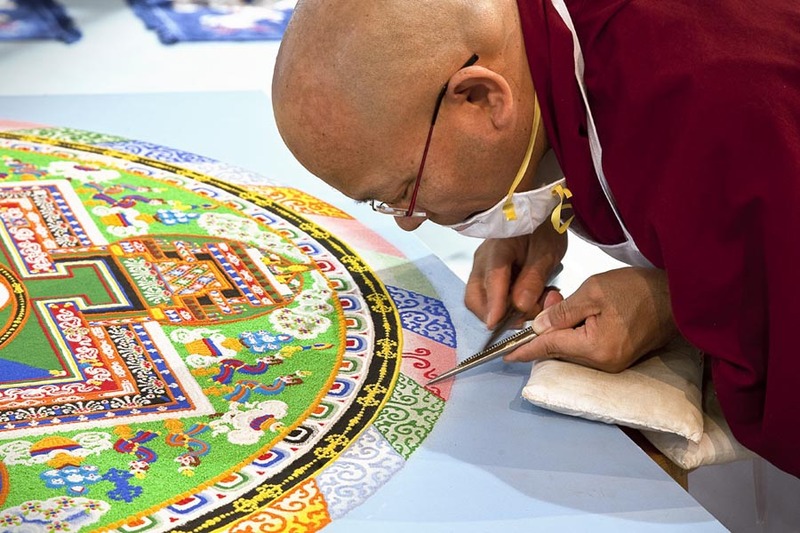 Buddhist Monks transform the gallery into a shrine where visitors can contemplate the impermanence of life by observing the monks spending many hours painstakingly creating an intricate mandala with coloured sands. opening ceremony 3pm sat 20 Oct, Closing 3pm Sat 27 Oct, admission is free. 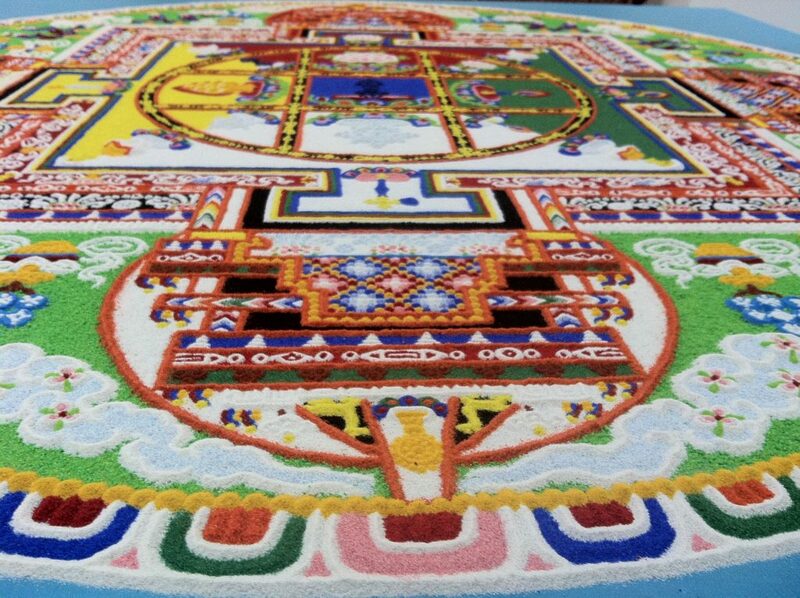 The project invites visitors to contemplate the impermanence of life by observing the monks spending many hours painstakingly creating an intricate mandala with coloured sands, which is then given back to the earth. On the last day the sands are ceremoniously swept up and transported to the river. The Mandala is an ephemeral work and the project demonstrates the cycle of life and death, reminding us that little is permanent. This Mandala will be the Namgyalma Mandala – the female aspect of Buddha of healing and longevity. The project showcases the Buddhist mandala as a living art form, and a traditional art practice that spans visual art and performance art. The sand mandala is an intricate sacred artwork which grows each day as sands are poured a few grains at a time, through ancient funnel implements. The mandala designs, which are 2,500 years old, have been passed through the ages and are constructed from memory, which is part of the rigorous training of a Buddhist monk. The meditation session each morning involve the monks chanting using harmonic singing. This in itself is a powerful sonic experience. 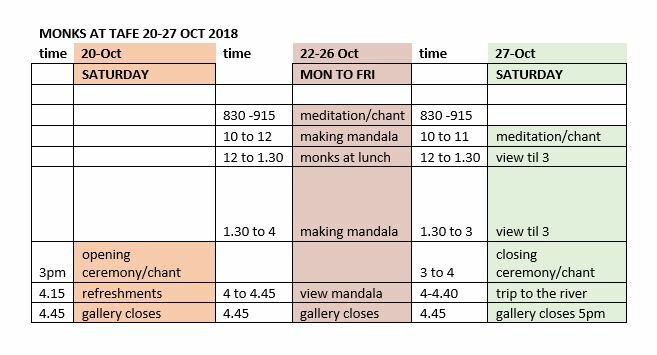 The monks are very experienced scholars and highly skilled in the arts – Venerable Thupten Lodey (resident in Perth) and chant master Venerable Thupten Jigme, (visiting from India).